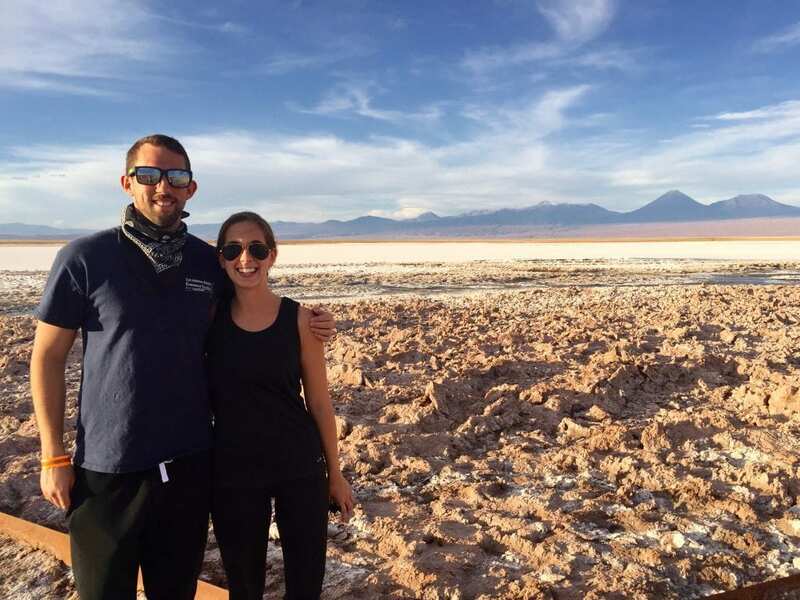 Today I’m going to be talking about a major South America bucket list item that I checked off a few weeks ago, with my friend Nick- visiting the Atacama Desert! 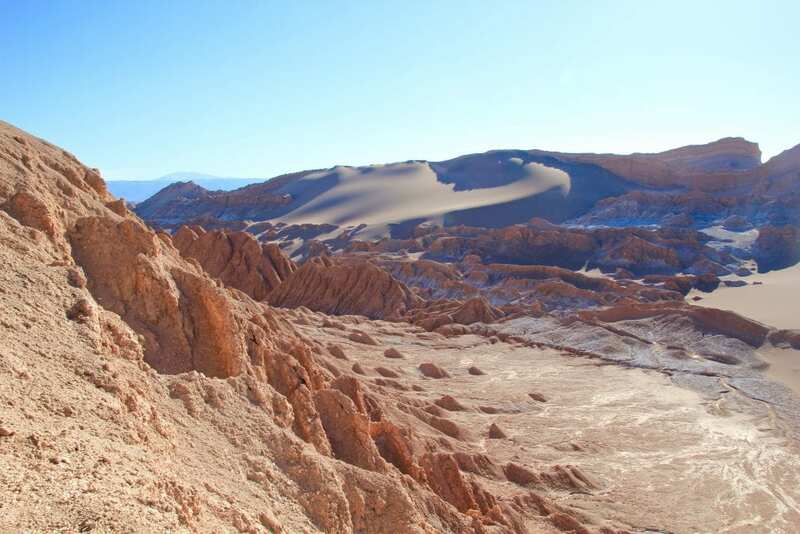 The Atacama desert is the driest non-polar desert on Earth receiving well under an inch of precipitation per year! 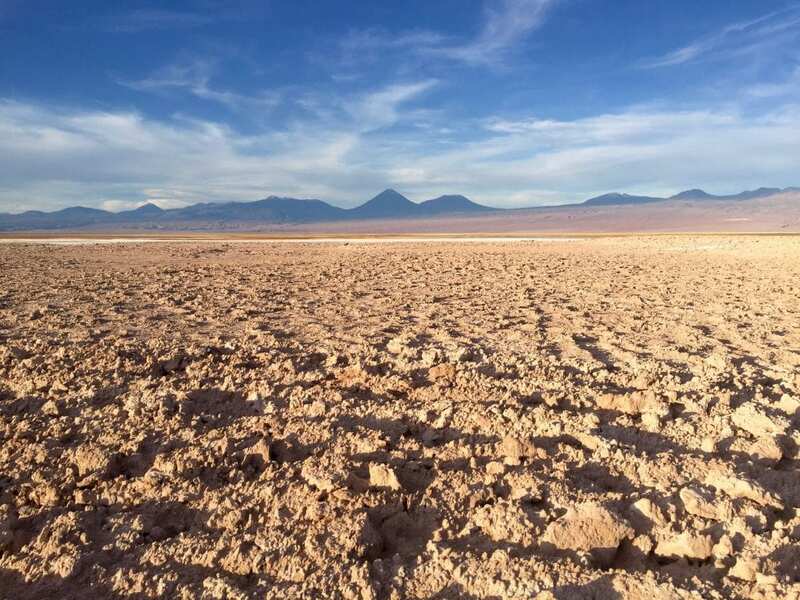 The parched land is almost completely lacking in moisture and can be found on a plateau stretching over 100,000 square km in the north of Chile. Bound by the Pacific in the west and the Andes Mountain Range in the east, this area is made up of other-worldly landscapes only comparable to planets like Mars. Boasting picturesque canyons, caves, volcanoes, salt flats and lagoons, the Atacama desert is a nature-lover’s dream come true! 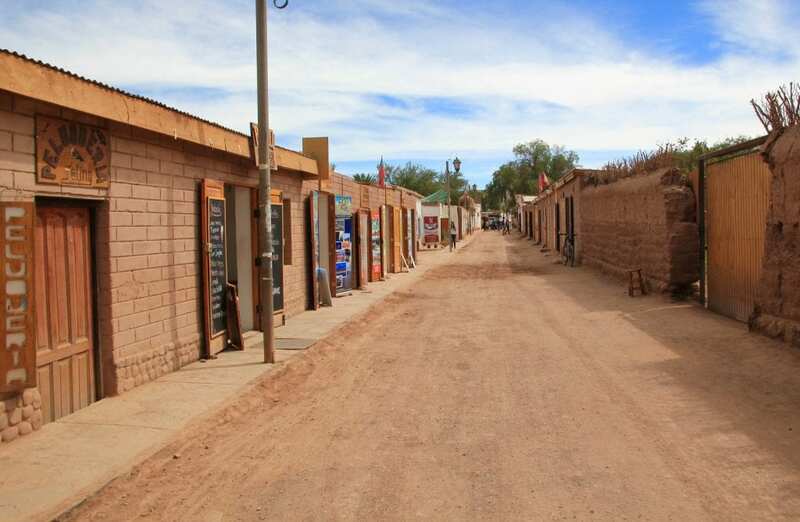 The main hub of the area, the little village of San Pedro, was once a mining town, but long ago capitalized on its surroundings, becoming a base for travelers who want to explore the area. Today, the town itself, is extremely tourist driven and its narrow streets are completely lined with tourist offices, hostels, hotels and mini-markets catering to the many incoming starry-eyed travelers. While San Pedro now unfortunately lacks any kind of authentic appeal, good food and service are plentiful and it’s an extremely convenient starting point for introduction to the desert. 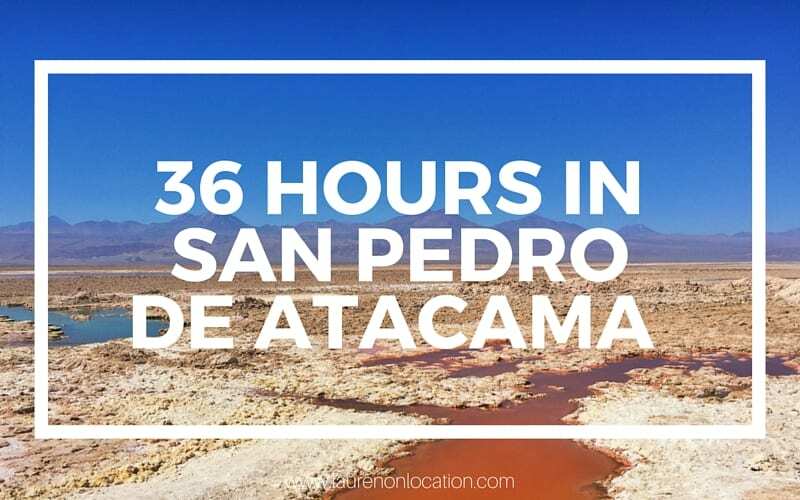 So, I know that this post is titled “36 Hours in San Pedro de Atacama,” but let me start by saying that 36 hours is NOT enough time to spend in this region of Chile. If you’re lucky enough to have the opportunity to spend more time here, do it! 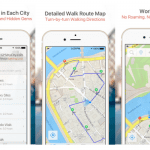 You could very easily fill a week with sights, trips, tours and activities. Ideally, I’d suggest 4 days. That being said, will everyone realistically have an entire 4 days of their lives to dedicate to this spectacular destination? The chances are- probably not. 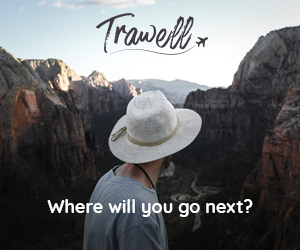 Does this mean that you should skip the trip all together? Absolutely not! 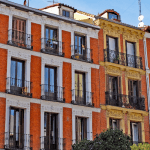 Just because you may not have as much time as you would like in San Pedro, does not mean that you should avoid it all together! While it may not be the ideal situation, you can accomplish a lot in a few days. Or in our case- 36 hours! A little planning and a lot of ambition will take you far in San Pedro. 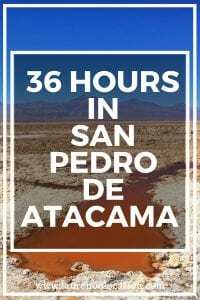 In this post I will outline exactly how I fit 4 tours, that’s right 4, into only 36 hours in the region of San Pedro. There’s also a video recap at the end of this post to give you an inside look, and hopefully persuade you to get there yourself! So, first off, why did I only have 36 hours in San Pedro? Surely, I could have budgeted my time a little better. Funny story. 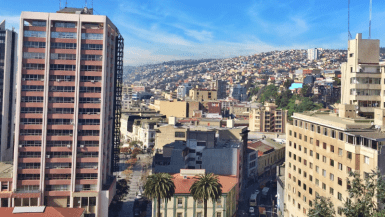 I did plan a longer stay in San Pedro, but, thanks to Chile’s low cost airline- SKY, my plans, well, they didn’t go as planned. Despite many Chileans advising against my booking a flight with SKY, my budget mindset took over my better sense and it was done. We planned weeks ahead of time, booked tours, had everything setup and figured all would be fine. Then, less than 24 hours before our trip, we were informed that all flights through SKY, for the next 4 days, had been cancelled because of a strike. Oh yeah, and this was over a month ago and we just now received a refund. Anyway, long story short, my friend Nick was heading back to the States on the following Thursday, so there was no time to reschedule and wait for SKY to get their sh** together. We booked a new flight with LAN, moved around a few tours, swallowed the extra fees and set off. Again, not the ideal situation, but hey, we were determined to make the most of it! In San Pedro, the times that tours are scheduled will allow you to plan more than one tour per day. Half-day tours last for about 4-5 hours and either leave super early in the morning, returning before lunch or later in the afternoon returning before dinner. Most of the tour companies that we encountered had their tours set up this way, so you could even mix and match companies! I know what you’re thinking, 4 tours in less than 2 days is A LOT! But, we didn’t really have a choice. If you’re short on time and want to see it all, sometimes you just have to pack it in. Plus, most tours have a nice lengthy bus ride where you can take a nap and recharge! After a long morning of travel and almost immediately after arriving at our hostel, we were picked up for our first tour! 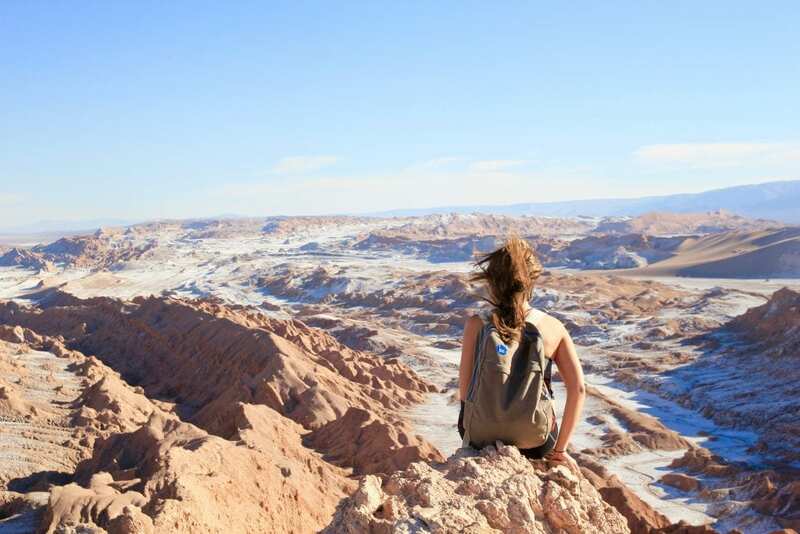 We had originally booked the Valle de La Luna tour with On Safari Atacama, but realizing we already had plans to see this on a different tour the following day, we changed our minds last minute to fit in some other attractions. On Safari offers tours on the pricier side in San Pedro, but it was definitely worth it! My friend Nick and I had a private tour and each had a chance to drive our own 4×4 quads through the desert, following our guide, Juan Pablo. We buzzed by sardine packed tour buses filled with camera happy tourists enviously starring down at us. Our off-road ride took us quite literally off the beaten path to places that the big tour buses can’t get to. Nick and I both agree that this tour, especially swimming in Laguna Cejar was the highlight of our trip! We effortlessly bobbed about like corks in the salt concentrated lagoon and later rode off into a dreamy pastel sunset. We couldn’t stop laughing. We couldn’t stop smiling. This tour was so exhilarating and I really felt to be one with the desert! It was truly an experience unlike any other! 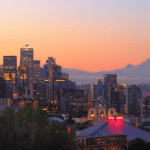 *If you are on a budget, there are many group tours available at a discounted price that take this same route and visit the same 3 attractions. Disclaimer: I received a discounted tour from On Safari Atacama for purposes of this review. As always though, all opinions expressed are my own. Our second tour of the trip picked us up at the crack of dawn. No that’s wrong, it was actually still dark out. Thankfully, we had a long relaxing ride up through the Andean mountains to the Lagunas Altiplánicas (highland lagoons), so I got to hit snooze. After about an hour’s journey, we finally arrived at our first stop, over 4,000 meters above sea level. We got to the curious Lagoons, Lagunas Miscanti and Meñiques just in time to catch the sun at the perfect angle, awarding us a spectacular view. The crystal clear bodies of water reflected the sky’s deep blue hues intensifying their magnificent mountainous backdrop. A sight to be seen. After some time gawking, exploring and snapping way too many photos, we returned to the tour van to find breakfast waiting for us. We loaded up on hot coffee, fresh avocado, cheese, meat and bread and then head off once again to our next stop! 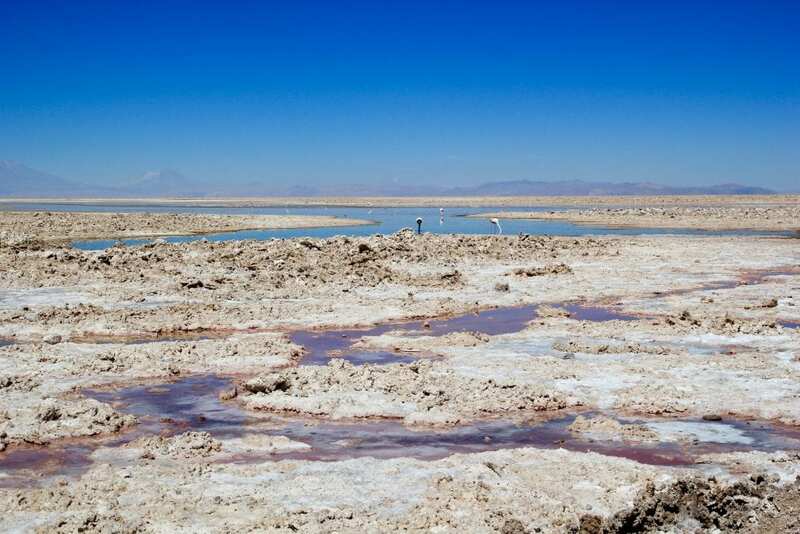 After a few small pit stops in between, our next memorable stop of the tour was Laguna Chaxa, yet another part of San Pedro’s Salar de Atacama. San Pedro’s Salar de Atacama is the third largest salt flat in the world by the way! The flat covers over 3,000 square kilometers and is completely enclosed by the Andes Mountains. Laguna Chaxa is also part of Chile’s National Flamingo Reserve and is a popular place to observe the pretty pink creatures in the wild. The area is extremely dry and really reflective, so it is not recommended to spend more than 20-30 minutes wandering about. Otherwise you risk leaving looking like a lobster. Despite the extreme conditions of the area, you can observe many species of wildlife as you follow the path around the colorful oasis, stretching as far as the eye can see. Lastly, on our journey back to San Pedro we made a quick stop in the small town of Toconao. 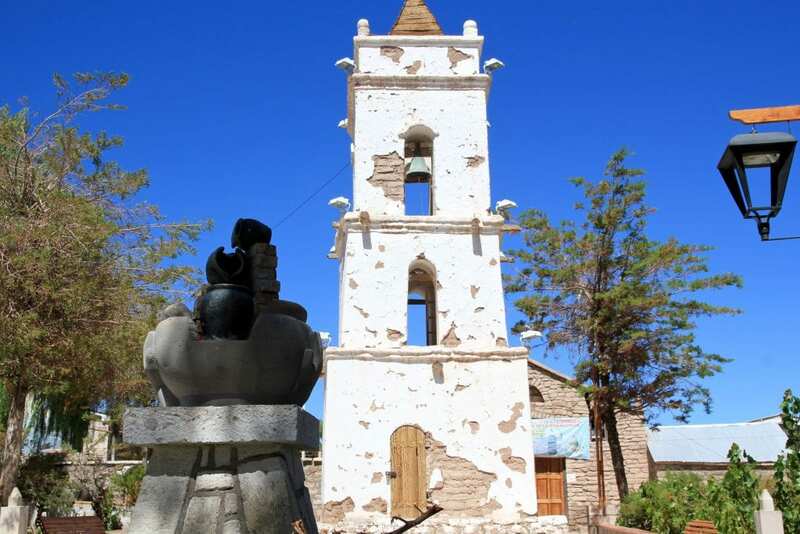 Toconao is a peaceful colonial village dominated by Atacama artisans and agriculturalists. 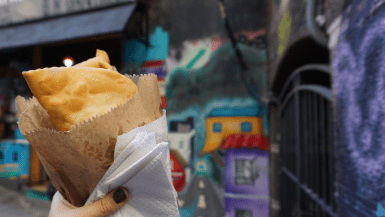 We were given time to grab a snack, wander around the town’s quaint narrow streets, and browse through local shops selling handcrafts such as knit goods made of alpaca wool. After a quick lunch break back at our base in San Pedro, we head off on yet another tour! 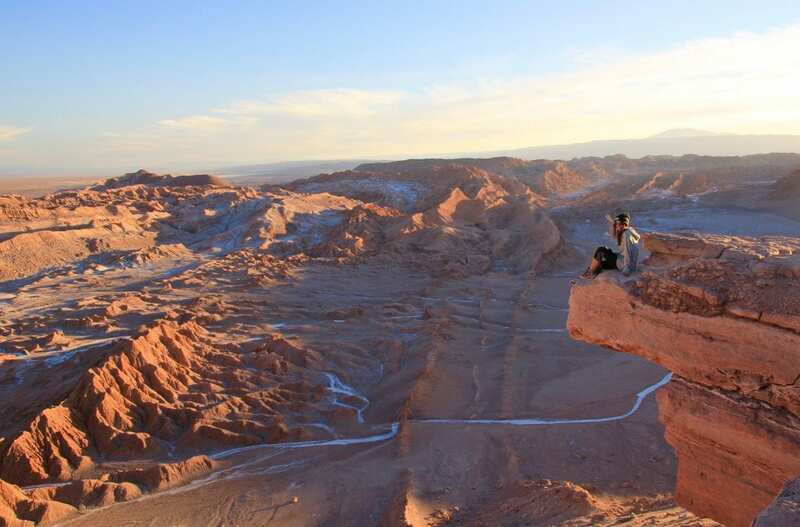 Many people had told us that Valle de La Luna was an absolute must see in San Pedro and it’s pretty easy to see why! The valley is named after its otherworldly, lunar landscapes and is known for its mysterious rock formations and large velvety san dunes. The absence of moisture in this area also makes it one of the most inhospitable places on Earth! AKA no wildlife to observe here! Once again we ventured out with Whipala Expeditions and weren’t at all disappointed! The tour was awesome, well planned and covered all of the main attractions throughout the Valley! We even got to climb into some very narrow salt caves! After lots of hiking, walking and exploring, we were given time to post up at Death Valley and watch the sunset. As the sun disappeared over the horizon, the wind-swept canyon constantly changed colors, staining the sky with pastel hues. No two minutes stayed the same. We bid the sun goodbye, took in one last breath of the landscape before us and head back to the bus once more. A long relaxing dinner and a catnap later, we forced our eyelids open at the sound of our alarm and head to our third tour of the day. It was a bit of a stretch, but we persevered and got our exhausted little buts on the next bus. Thankfully, upon arrival to the designated stargazing spot, we were provided with blankets, a glass of wine and a warm cup of coffee, which definitely helped perk us up. Now I was ready to sit back, relax and gaze away! If you can muster the energy after a long day of touring, I highly suggest you try to take an astronomical tour. The Atacama Desert is one of the top destinations in the world to view the night sky. Outside of the small village, away from all light pollution in the expanse of Atacama darkness, the vision is truly incredible. Crisp, clean air and unadulterated, white, bright galaxies. We were able to see a number of astronomical formations, only visible in the Southern Hemisphere, several planets including Jupiter, Saturn and Mars and lose ourselves among the cloudy Milky Way. I’ve never, in my life, seen anything like it. *I recommend booking stargazing tours ahead of time, as they do seem to sell out very quickly. 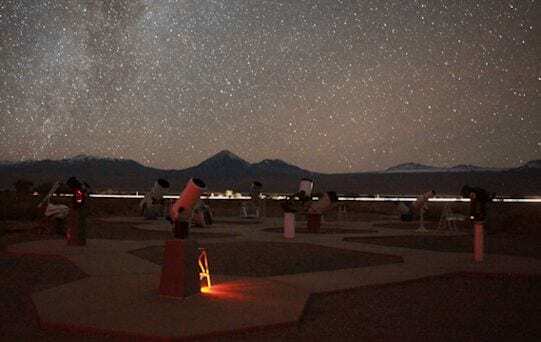 The most popular and reputable company for stargazing in San Pedro is Space, but there are a few other options as well if Space is already booked. Still want more? 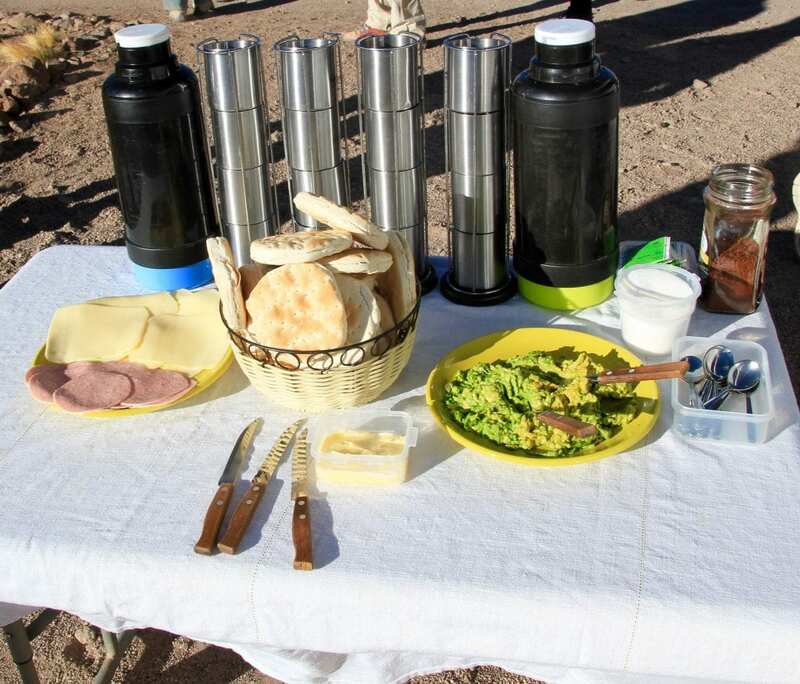 I have an Atacama Highlights post coming soon with dining suggestions, must dos, where to stay and more! After a day and a half of packed-in Atacama tours, I have to admit I returned back to Santiago a bit zombie-fied. Still, I have zero regrets and stand my statement that I would do it all over again! Every last minute was worth it! Okay! You finally made it to the end! Here’s the inside look you were waiting for! Choose the HD setting to view with better quality! *Even though this post is technically a little longer than “One Day” – I thought I’d add it to the series. Sadly, if you only have one day in San Pedro, I would suggest that you skip it. The traveling to get there alone could take a full day! This week on #WanderfulWednesday, I’m highlighting last week’s post “Matera: Prehistoric Caves or Luxury Hotels” by La Brutta Figura! The ancient city of Matera seems like such a crazy unique sight and I’m always looking for new spots to add to my bucket list! If you haven’t already, be sure to go check it out and spread the love! We’ll also be pinning our contributor’s posts to our new Pinterest Board! That looks INCREDIBLE!! And thank you very much for featuring my post this week! Thanks for linking up Rebecca! That’s so frustrating about Sky, but it looks like you made the most of your time in San Pedro. I love all of your pictures and that guac has my mouth watering! Thanks Courtney! And yeah the avos here in Chile are pretty unreal!! I don’t think I’ll ever be tired of them! I had no idea that this even existed in Chile! I personally think that the desert is so incredibly beautiful and would love to visit! Y’all really packed so much into 36 hours, and I’m glad that y’all were still able to do all of those amazing tours, despite the problem with your flights! Thanks Ashley! 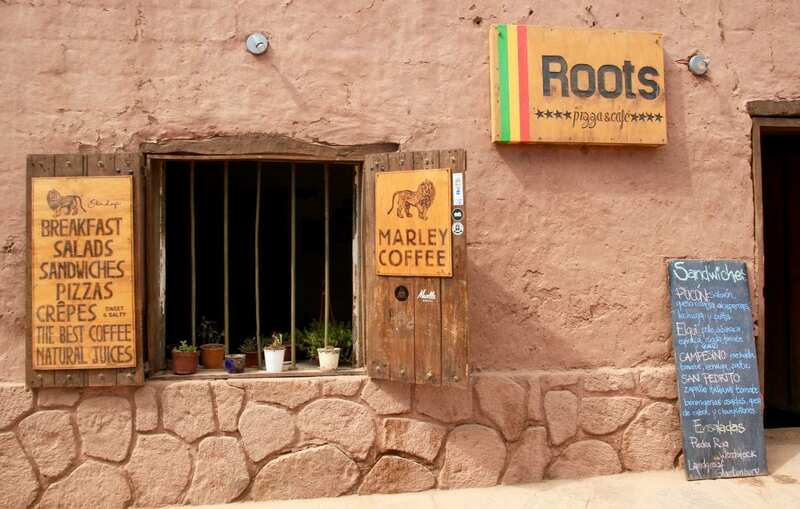 I didn’t know about this place either, until I arrived in Chile! From Santiago the flights are so cheap, I couldn’t resist! Awesome photos and an amazing trip, despite it being packed into 36 hours. 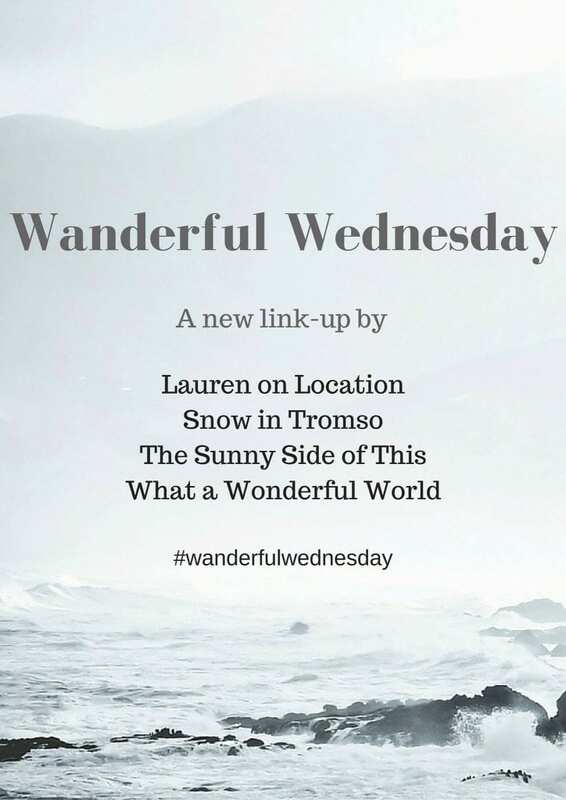 Thanks for sharing it at Travel Tuesday, Lauren. I see that you have a travel blog hop on here as well so decided to link up. I am hypnotized!! 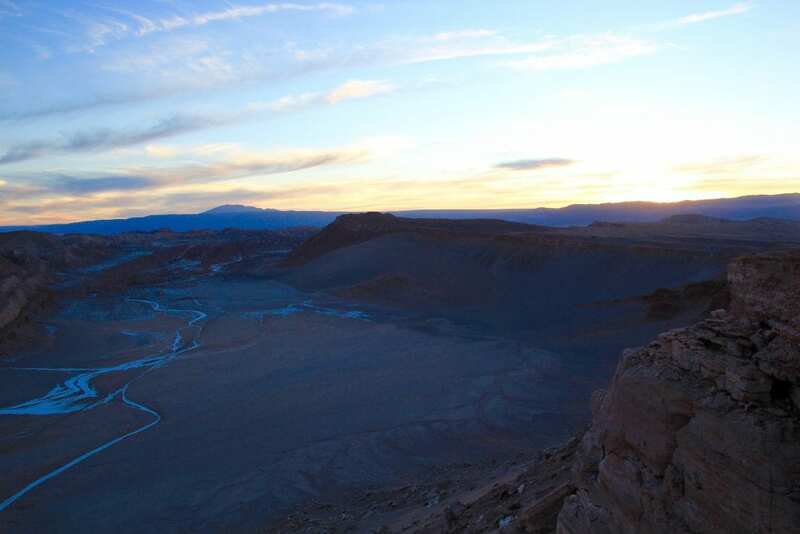 Visiting the Atacama Desert is in my bucketlist as well. I didn’t know you could a lot time to explore it. But spending a week there would be a dream for me! Maybe include a couple of spas if there are any. Thank you for the recommendations! That landscape is absolutely awe inspiring. So much natural beauty I can’t handle it! I’m impressed at how you packed your time full, I’d have been ready for a good nap by the end of tour 2…! I’d love to visit one day, although I have to say my ultimate desert bucket list item has got to be the Nazca lines. Any chance you can go there and I can travel vicariously through you!? I’d love to go there so you can travel through me! Hahah And trust me.. I was napping on the bus in between every single tour! … my friend has the pictures of me passed out, mouth open to prove it haha But seriously, Rachel get to a desert! They are some of the most beautiful places I’ve ever seen! Wow, what an incredible area! I would love to visit and hike and explore. You sure managed to pack a LOT in! Lauren, that video!! It’s incredible, and worth of all of your hard work – I loved it!! Also, what a great and informative post 🙂 I really would love to head up there again because it really is such a beautiful place. Yay for Chile and it’s diverse landscapes. Thanks Marcella! Wish it didn’t take me so long to make the videos! I was already thinking I may have to go back up there before I leave haha .. so much more to see and do! This is a great post, really detailed. Bookmarking in case I ever make it to Chile! Excellent post Lauren! Agree that there are tons of things to do in the area. 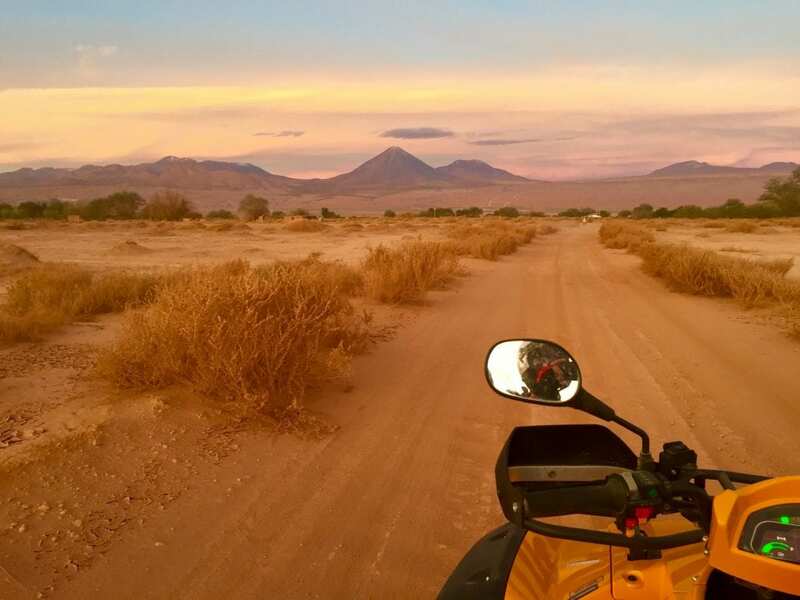 I am reading stories about the Atacama Desert from two other bloggers and some of the activities they did are every different from your (but super scenic). If I ever go, I will try to stay as long as possible. It’s a good idea to stay as there are so so many things to do and see! We chose the most convenient tours for our short stay, but there were still so many others calling my name! I feel like I could go back all over again and have a very different experience! you got so much done in 36 hours, I am also one to take as many tours as I possibly can to make the most of the time! p.s. the button code is not working. ha-ha, you are certainly not scared of height! Lovely video!